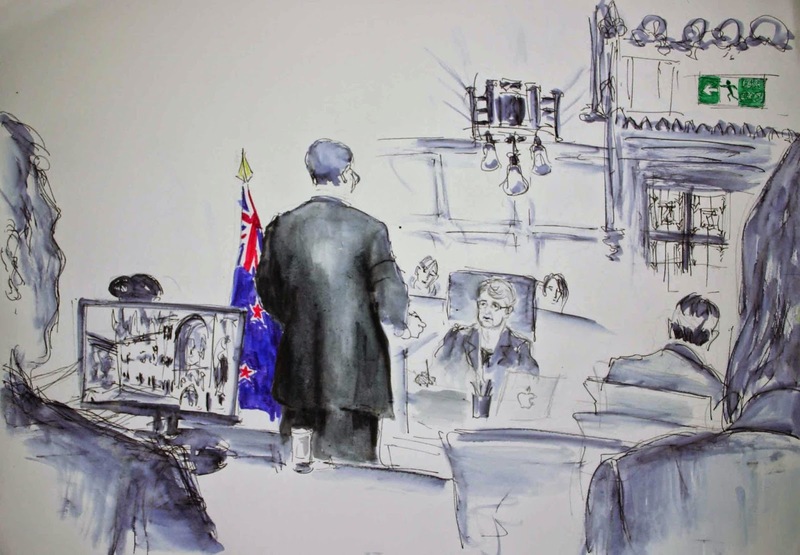 One for spotters: Pora v The Queen will probably be the last case from New Zealand in the Judicial Committee of the Privy Council. 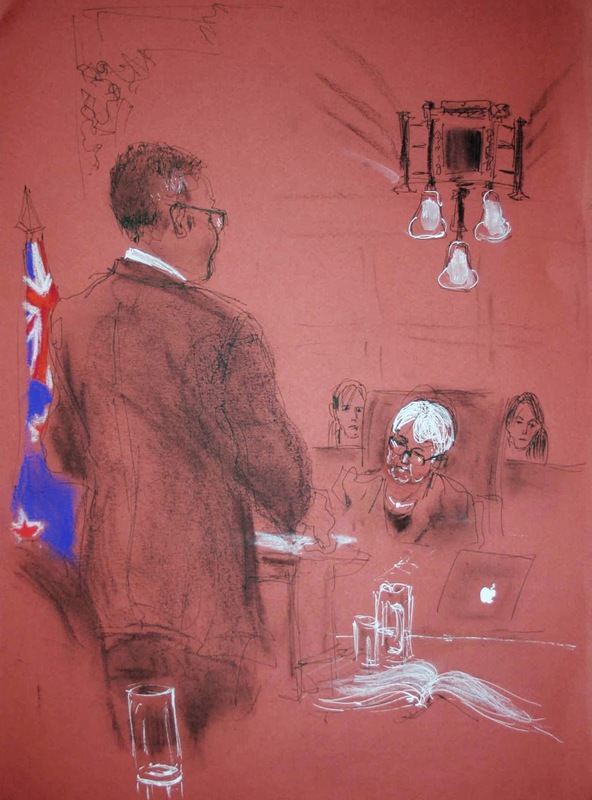 Dame Sian Elias, the most senior lawyer in New Zealand, sits on the bench at Lord Kerr’s right hand. 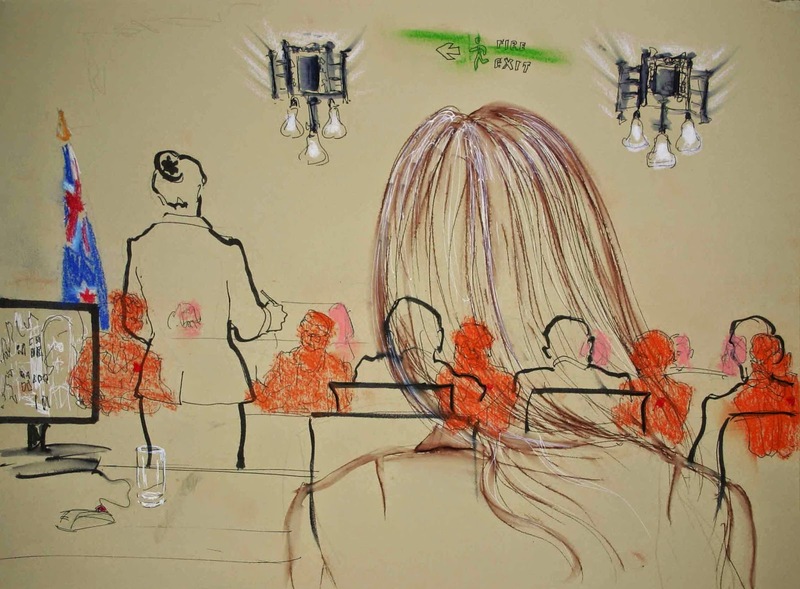 Monitors are in position to show an extreme rarity in this court – evidence. Meanwhile, the soundscape. Exotic ring tones (tsk tsk). Briefly, a mewling infant, which provokes some judicial throat-clearing. And from the pavements below (one of the world’s tourist hotspots), nothing. Lord Walker told me that he once saw, but did not hear, a helicopter land outside the court – the double-glazing is that good. People shifting on the leather-upholstered public benches make them creak like a sailing ship. A girl in front of me has long swishy hair. My pen and brush swish on the textured paper, in her ear. She doesn’t know she is hearing the rhythm of her hair being drawn. Around the court, the Apple logo comes over loud and clear. We are here because a woman was raped and murdered. 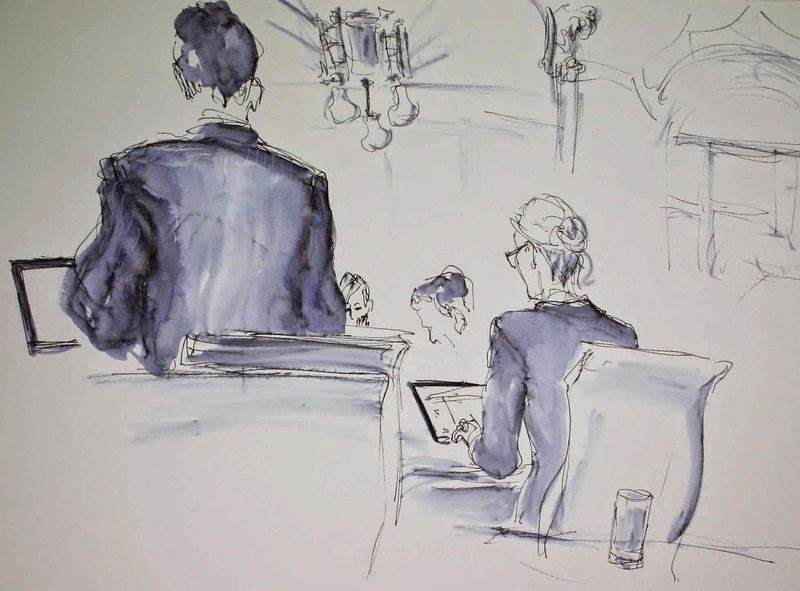 I wonder where to look for statistics on how many women around the world were reported to have been raped and/or murdered during the six hours and 45 minutes of this two-day hearing, leaving aside the unquantifiable unreported cases. 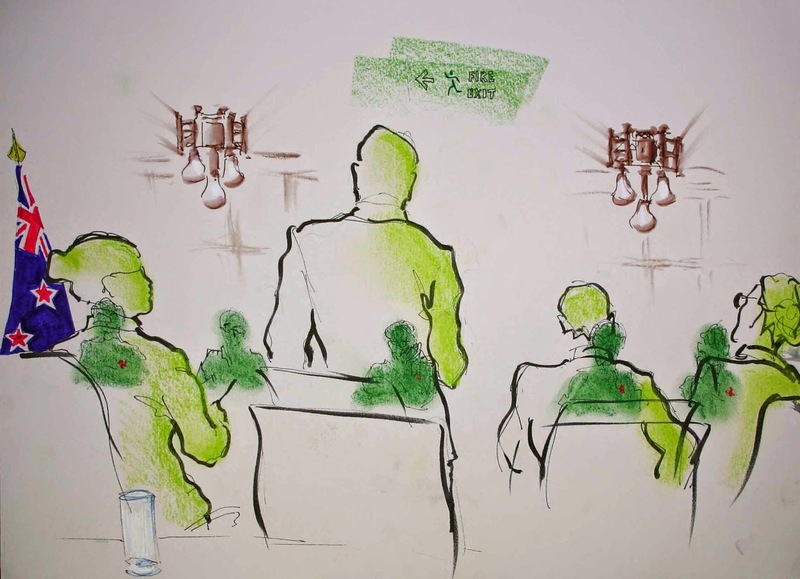 Here in court the dryness of the legal process mercifully cauterises emotion, beyond the more evident adrenalin surges of counsel when probed by the bench or temporarily losing the compass. The appellant has a diagnosis of foetal alcohol spectrum disorder. With sad timing, the Court of Appeal is examining whether it is a crime for a woman to drink excessively while she is pregnant. 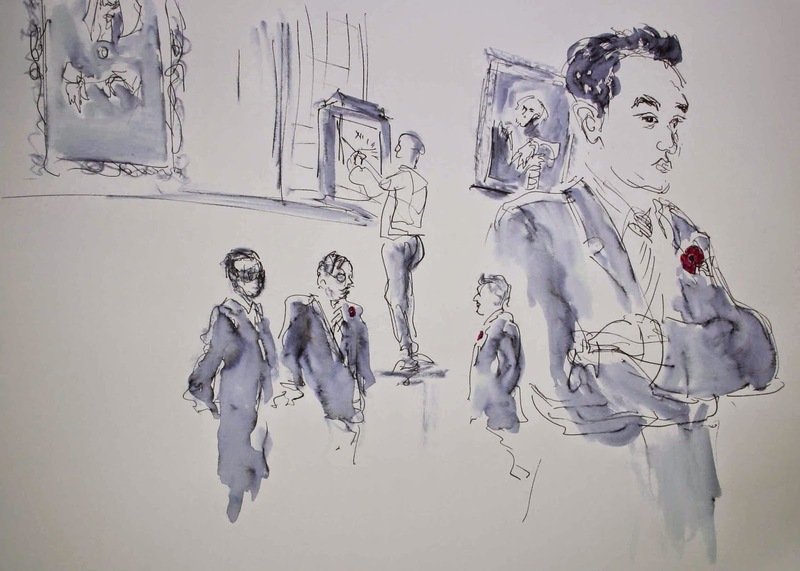 Coda: there is an exhibition of my Supreme Court drawings at Pinsent Masons’ Crown Place office from 14 November until early January. 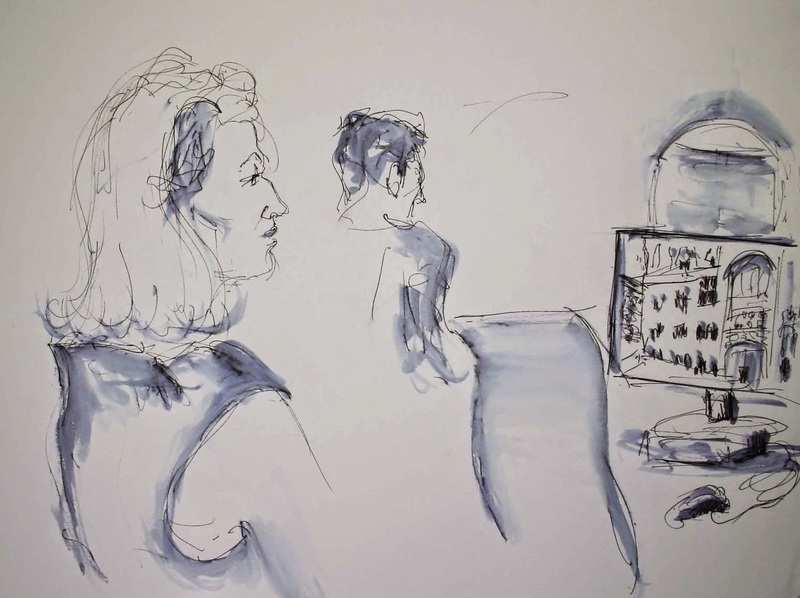 This post originally featured on Isobel’s blog Drawing from an uncomfortable position 5 November 2014. Leave a reply on "Supreme Court Art: the last of England"